Keep tightly capped. SHAKE WELL BEFORE USING. Product may damage jewelry; remove jewelry before use. Apply to affected areas and lather with a small amount of water. Allow to remain on skin for 10 minutes. Repeat this procedure once a day for 7 days. For treatment of dandruff and seborrheic dermatitis of the scalp. Massage 1 or 2 teaspoonfuls of shampoo into wet scalp. Allow to remain on scalp for 2 to 3 minutes. Repeat application and rinse thoroughly. After treatment, wash hands well. Repeat treatments as directed by physician. For External Use Only. Do not use on broken skin or inflamed areas. If allergic reactions occur, discontinue use. Avoid getting shampoo in eyes or in contact with genital area as it may cause irritation and burning. FOR EXTERNAL USE ONLY. WARNING: KEEP THIS AND ALL MEDICATIONS OUT OF THE REACH OF CHILDREN. Store at controlled room temperature, (15 - 30) °C ((59 - 86) °F) [see USP]. Selenium sulfide appears to have a cytostatic effect on cells of the epidermis and follicular epithelium, reducing corneocyte production. For treatment of tinea versicolor, seborrheic dermatitis of scalp and treatment of dandruff. Not to be used by patients allergic to any of its ingredients. Not to be used when acute inflammation or exudation is present as increased absorption may occur. See Warnings and Precautions section under Application Instructions. Dermal application of 25% and 50% solutions of 2.5% selenium sulfide lotion on mice over an 88 week period, indicated no carcinogenic effects. 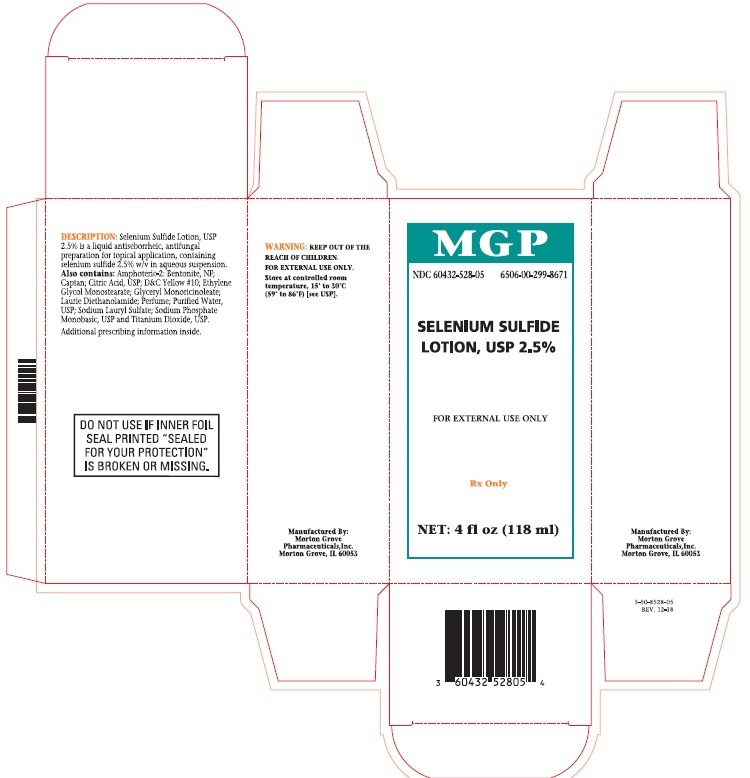 WHEN USED ON BODY SURFACES FOR THE TREATMENT OF TINEA VERSICOLOR, SELENIUM SULFIDE LOTION, USP 2.5% IS CLASSIFIED AS PREGNANCY CATEGORY C. Animal reproduction studies have not been conducted with selenium sulfide. It is also not known whether selenium sulfide can cause fetal harm when applied to body surfaces of a pregnant woman or can affect reproduction capacity. Under ordinary circumstances selenium sulfide should not be used for the treatment of tinea versicolor in pregnant women. Safety and effectiveness in infants have not been established. In decreasing order of severity: skin irritation; occasional reports of increase in normal hair loss; discoloration of hair (can be avoided or minimized by thorough rinsing of hair after treatment). As with other shampoos, oiliness or dryness of hair and scalp may occur. No documented reports of serious toxicity in humans resulting from acute ingestion of selenium sulfide, however, acute toxicity studies in animals suggest that ingestion of large amounts could result in potential human toxicity. Evacuation of the stomach contents should be considered in cases of acute oral ingestion. Apply to affected areas and lather with a small amount of water. Allow product to remain on skin for 10 minutes, then rinse the body thoroughly. Repeat procedure once a day for 7 days. Usually two applications each week for two weeks will afford control. After this, the lotion may be used at less frequent intervals â€“ weekly, every two weeks, or every 3 or 4 weeks in some cases. Should not be applied more frequently than required to maintain control. 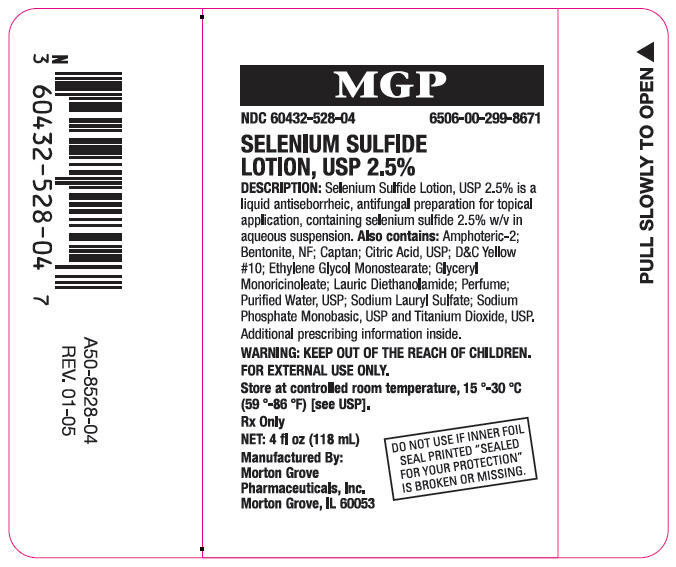 Selenium Sulfide Lotion, USP 2.5% is supplied in 4 fl oz (118 mL) bottles. PROTECT FROM HEAT. FOR EXTERNAL USE ONLY. Phosphate Monobasic, USP and Titanium Dioxide, USP. ((59 - 86) °F) [see USP].